The fit of these jackets is just a touch smaller than most other “alpha” sized jackets, so if you tend to be between sizes then I’d advise you to choose the next bigger size, but if you are almost always one size then choose that size (example: if you are always a medium, then buy the medium jacket, but if you sometimes take a large and sometimes take a medium, then try the large). If you need help choosing an “alpha” you can take a look at Joe Rocket’s sizing chart which is based upon measurements. 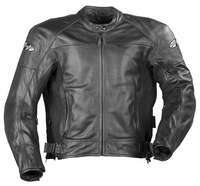 The Sonic offers the looks and protection of a full leather sport jacket in a slightly more casual style than most. The jacket includes removable dual density armor in the shoulders and elbows and also a foam back pad, but the armor is under the leather outer shell and isn’t as noticeable as with some sport jackets so you’ll feel comfortable wearing this jacket just about anywhere. For use in colder weather, you can use the removable thermal vest-type liner. For hot weather use, this jacket has textile panels that can be removed. Under these panels is mesh material that should admit a lot of air flow through the jacket—certainly more than with traditional zipper-vent styles. If you are interested in wearing this jacket with pants, you’ll have a lot of choices. The jacket comes with both a short rear zipper and a full circumference zipper, so you could choose nearly any compatible Joe Rocket pants in either leather, mesh or textile (depending upon taste and use).